An Oregon family describes how they managed to save eight kids from drowning in an lake. KGW's Erica Heartquist reports. If not for them, this story would have a tragic ending. Six family members in Oregon are credited with saving eight children from drowning in a lake over the weekend, investigators said. Evan Gibson, April MacLean, Lorne MacLean, Lura Kirby, Michelle Rushing and Eric MacLean were attending a family reunion Saturday in a picnic area near the shore of Henry Hagg Lake when the group heard people screaming. 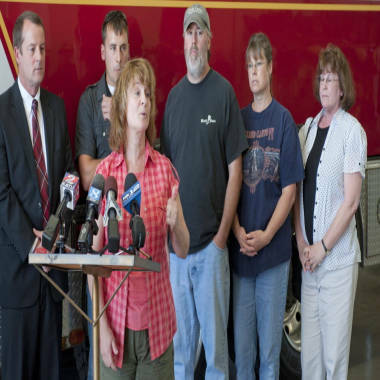 Michelle Rushing (front) explains Sunday at a press conference how she and her family saved eight kids from drowning in Henry Hagg Lake in Oregon. Other Gibson family members are (from left) Evan Gibson, Eric MacLean, Steve MacLean, April MacLean and Laura Kirby. Investigators say eight children, ages 6 to 13, and a few adults stepped off a steep drop-off as they waded out into the lake. Seeing this, the six family members jumped into the water and started pulling the children out. “I started yelling, ‘They’re drowning, they’re drowning,’” Michelle Rushing said at the news conference. Gibson was the first to reach the water and saved two of the children’s mothers, who had run in after them but couldn’t get past where the lake falls off from ankle deep to 15 feet, the Oregonian reported. April MacLean then grabbed the first two bodies she could get hold of and passed them to Gibson. Farther in the water, Rushing grabbed a small girl but tripped over another submerged body. “We realized we had no idea how many were underwater,” Rushing said. “She quickly dug for the second body, another unconscious girl, and passed both children to Eric MacLean. “We just sort of formed a chain, but I had tripped over a couple of them, and so I was trying to get down and I brought one up,” Rushing said. Within four minutes, the rest of the eight children had been accounted for, the Oregonian reported. Moments later a dive team from the nearby Gaston Fire Department arrived to find damp, mud-covered children and adults wrapped in towels, panting. “You can call it luck, but I call it good old hard work and paying attention to human life,” Messenbrink said. Investigators say the close call could have been avoided. None of the kids was wearing a life jacket, even though a nearby life jacket loaner station was fully stocked. “I hope that people will learn and whether their children are good swimmers or not, have them in life jackets,” Rushing said. As a precaution, paramedics took all the kids to the hospital, and all were released.